Travel and books go together, just like “Fish n Chips” or “Gin n Tonic”. Sure, Venice pairs perfectly with the word “romance.” But don’t come away without checking out the city’s charming boat bookstore. Libreria Alta Acqua which literally translates to “Library of High Water” is nothing like your everyday bookstore or library. You are greeted by a sign outside saying “Welcome to the Most Beautiful Bookshop in the World.” Upon entering, you’ll be amazed to find a full size gondola in the middle of the bookstore overflowing with ancient books on art, history, dictionaries and biographies. To complete the furnishings, there are also poles, oars and mannequins. Whenever the channels of Venice get flooded during Acqua alta, the gondola simply floats on water, keeping the books dry and safe. Libreria Alta Acqua is actually a mix between a bookstore and a flea market. If you are lucky, you might stumble upon some antique books or one of the four domesticated cats. 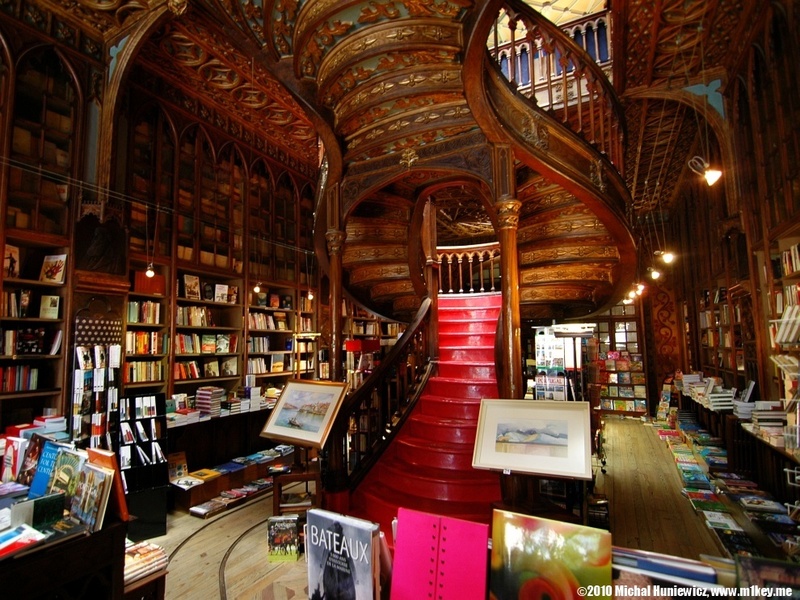 Legend has it that JK Rowling conceived the idea of Harry Potter after being inspired by the beauty of Liveraria Lello, which she visited regularly while living in Porto in the early 1990’s. The tagline of this bookstore itself is enough to make you want to find it! The Montague Bookmill is housed in an 1842 gristmill, set on the banks of the Sawmill River, a few miles north of Amherst and Northampton, Massachusetts. The interiors of the mill have been revamped but still retain most of the characters of the original building, with scuffed wooden floors, giant windows, and traces of the industrial nature it once had. It mostly houses used academic book ranging from everything from Austen and anarchy to Zola and zoology and sells them at half the original price. 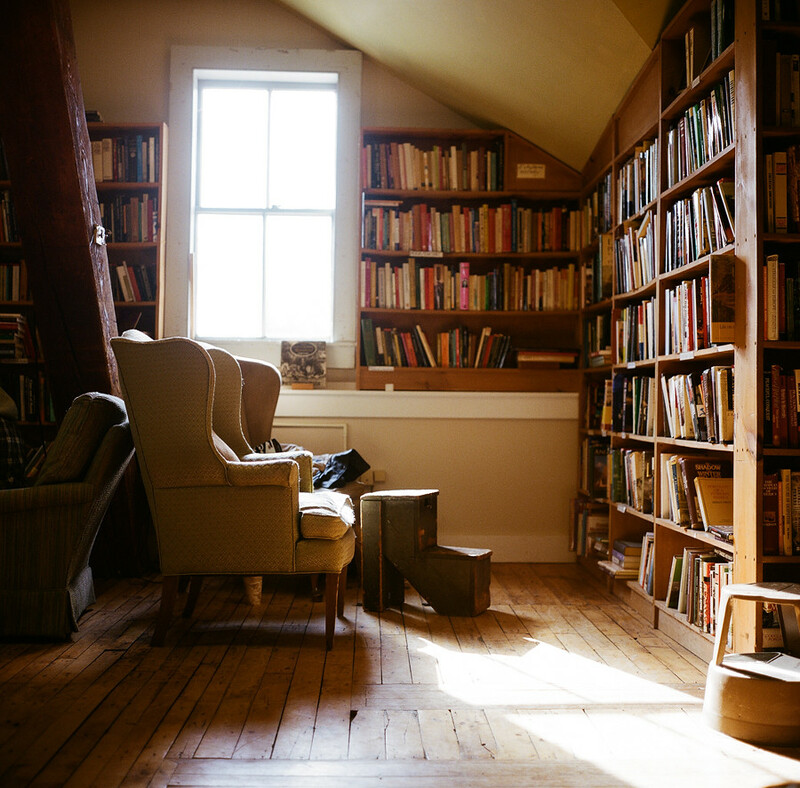 It’s not a conventional bookstore and does not maintain any catalogues. The idea is to browse books personally along the maze like aisles and staircase which make the experience as exciting as reading. However, if you fail to find the book you’re looking for, they claim to find you a better one that you didn’t even knew you wanted. Santorini is a place where people read sunsets more often than books. 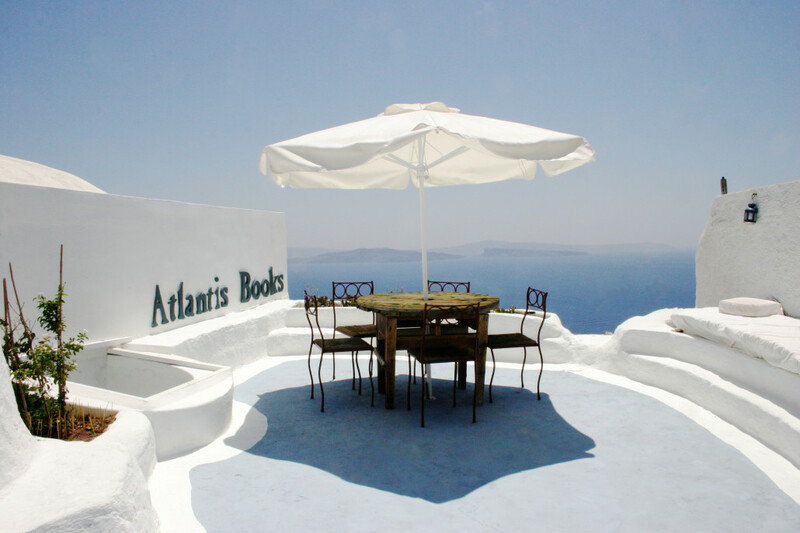 For this reason maybe, this small group of islands lacked a good bookstore until two travelers, Craig Walzer and Oliver Wise decided to open Atlantis Books in 2004. The story goes that back in the spring of 2002, Oliver and Craig spent a week on the island of Santorini. They had finished their books and couldn’t find anything they liked in English at the local bookstores, where the selection was limited to detective novels and guidebooks. 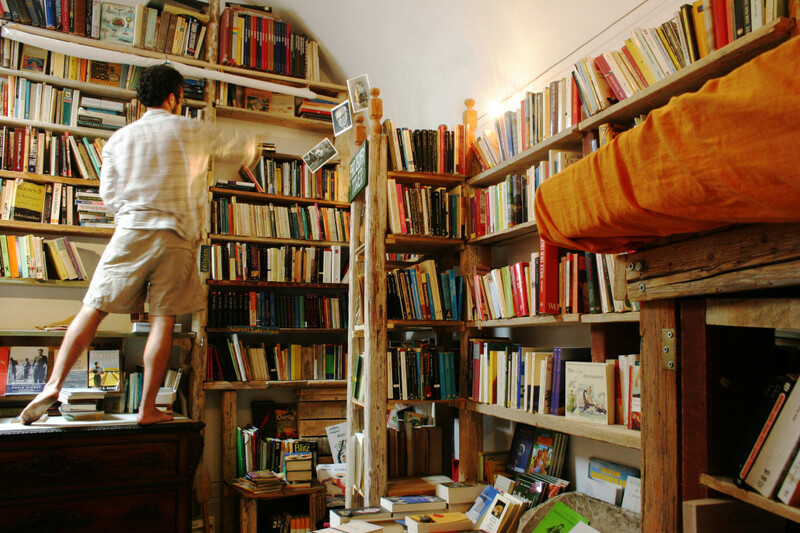 Intoxicated by Santorini’s beauty, they decided to open a shop modelled on Shakespeare & Company, the English-language bookstore in Paris. Jeremy Mercer of The Guardian describes Atlantis as a dream of a bookstore. Perched on the cliffs of the volcanic island in a postcard-worthy Greek villa, visitors can spend their afternoons reading a Ryszard Kapuscinski or Jamaica Kincaid title while listening to some jazz playing in the background. The store also hosts food and film festivals, and writers’ readings and is slowly becoming a landmark in Oia. Travelers who are not even reading enthusiasts make it a point to pay this place a visit just to click some pictures worth remembering. 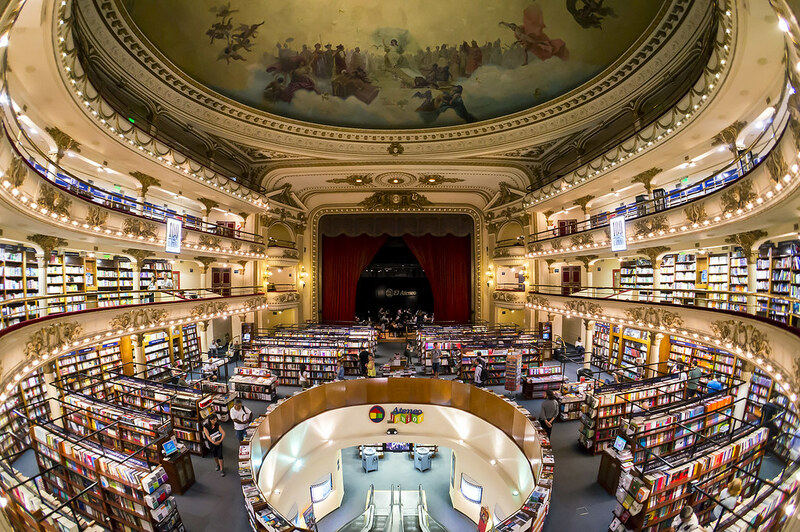 Grand theatre turned bookstore, El Ataneo Grand Splendid is the creation of architects Peró and Torres Armengol and makes its place as one of the most beautiful bookstores in the world. Originally built as a theatre for performing arts in 1919, it was converted into a movie theatre in 1929 until poor economic condition forced the theatre to be closed down. It was slated for demolition when the Ilhsa Group, owner of the El Ateneo publishing house bought the building. They subsequently renovated and converted it into a book and music shop while still retaining the original interior architectural details including the brilliant frescoed ceilings painted by the Italian artist Nazareno Orlandi, and caryatids sculpted by Troiano Troiani. 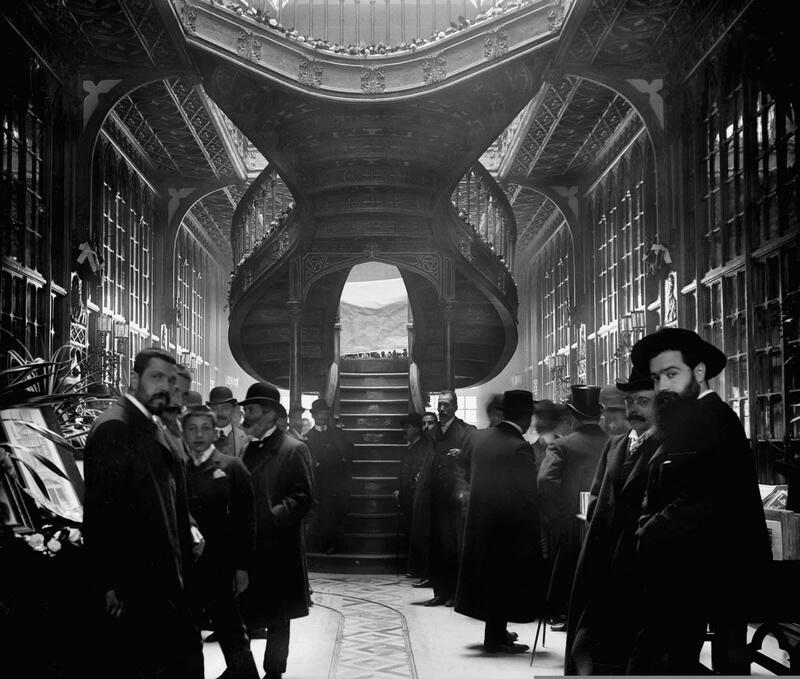 While the staggeringly opulent display of books is reason enough to pay El Ateneo Grand Splendid a visit, one can also indulge in coffee and live piano music on the very stage where the Argentinean stars of tango once performed to witness its complete splendor. 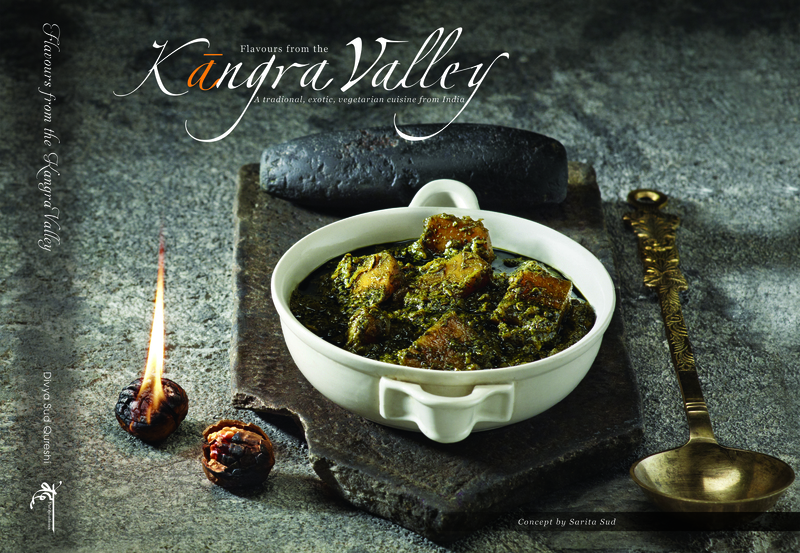 A good book about Himachal cuisine? This is one of the most beautifully designed cookbooks we have seen in recent times. The photographs by Israr Qureshi will make you want to pick the dishes off the pages. The content is luscious, too, filled with traditional vegetarian recipes from the Sud community, which calls the Kangra region home. Interestingly, Kangra cuisine does not employ much of onion, garlic and ginger. Its kitchen stars are curds and spices such as coriander, amchoor, chillies and cumin. In the book, there are recipes for Gulabi Mahni (black lentil soup), Baree Pulao, Mandra (spiced vegetable and yoghurt curry), Patore (colocasia rolls) and much more. There is a section on typical Kangri desserts and achars, too.